This summer I was asked to renovate a weedy, overgrown raised bed into an edible garden that includes some native species perennials for pollinators in downtown Saratoga Springs, NY. 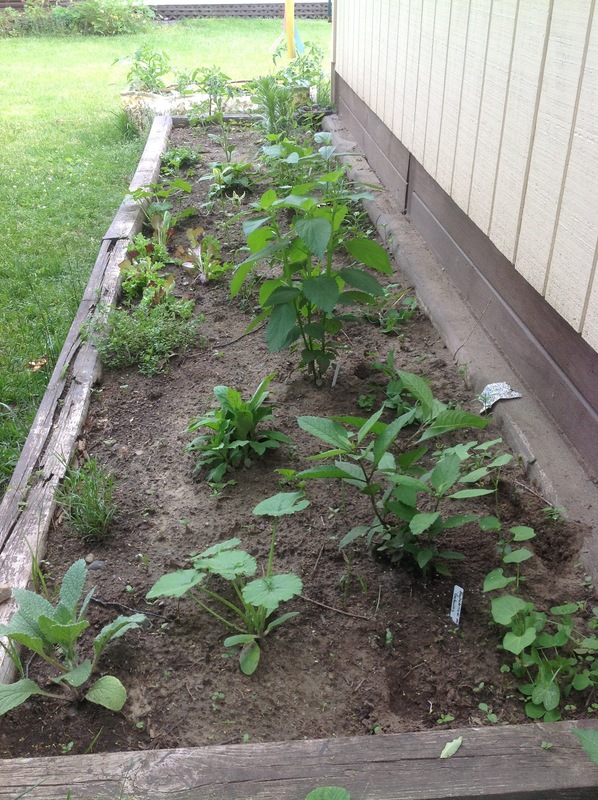 After ripping all the weeds out and setting up the new, non-permanent raised bed just for the kids, we added a mix of vegetables, herbs and perennial wildflowers. The Saratoga native flower species are in place to attract pollinator species: native bees including bumblebees, butterflies, dragonflies, ladybugs and mini pollinator wasps. This makes organic gardening easier by tapping into the ecosystem’s natural checks and balances- if pest insects like aphids or cucumber beetles show up, the predator insects (ladybugs, wasps, soldierbugs) will already be there, ready to cull the pest population. The same concept is the reason the herbs get planted in with the vegetables: the stinky herbs can help keep vegetable garden pests away and attract predator, or beneficial, insects. Borage and Nasturtium are both planted throughout this garden; these are two of the most potent annuals for the edible garden. Both Borage and Nasturtium have an aroma that’s distasteful and discouraging to pest insects, and attractive to bees and other pollinators. Borage is said to be indispensible in the pollinator garden, and its leaves are steeped in drinking water for a crisp, fresh taste in England. Nasturtium’s flowers attract hummingbirds and its silver-dollar shaped leaves are edible, and taste like peppery spinach. The mix of native species perennial plants in this raised bed include Blue Lobelia (Lobelia siphilitica), Joe Pye Weed (Eupatorium maculata), NY Ironweed (Vernonia noveboracensis), Ox-Eye Heliopsis Heliopsis helianthoides), Blazing Star (Liatris spicata), False Lupine (Thermopsis caroliniana), Giant Yellow Hyssop (Agastache nepetoides), native Pink Coreopsis (Coreopsis rosea), Mahogany Beebalm (Monarda didyma, “Mahogany”), Golden Alexander (Zizea aurea) and Lorraine Sunshine variegated Heliopsis. 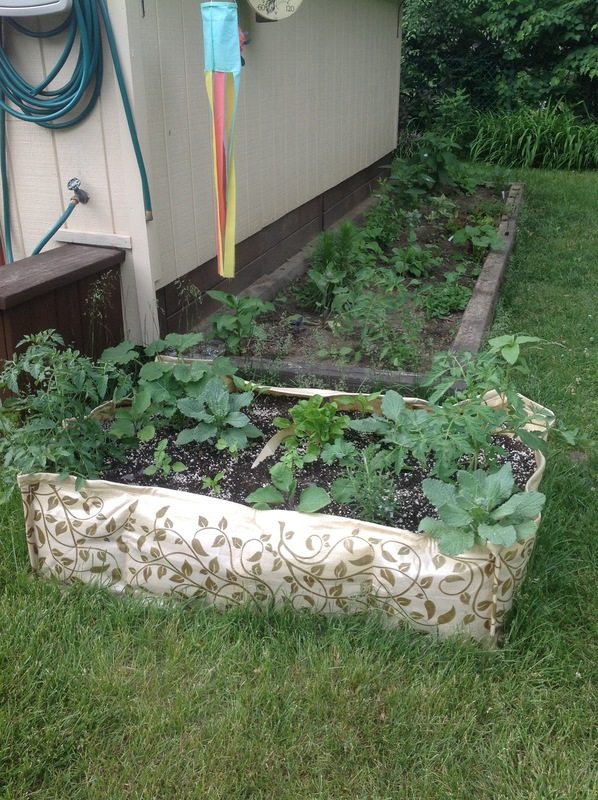 The raised beds are planted densely to organically prevent weeds from even starting. This mix of native perennials will ensure a steady parade of hummingbirds, songbirds, butterflies and other pollinating insects in the backyard edible garden of this lovely downtown Saratoga Springs, NY home.